Martin Chuzzlewit is the story of the eponymous Martin, who is apprenticed to the architect Mr Pecksniff, a distant relative of Martin's grandfather (confusingly also called Martin Chuzzlewit). Old Martin is incredibly rich and very old, and consequently his relatives - including his brother Anthony and nephew Jonas - are squabbling over his fortune. Whilst young Martin was expected to inherit the bulk of the money, he has become engaged to old Martin's companion, a young woman named Mary Graham, and consequently old Martin has disinherited him, leaving him to make his own way in the world. This seems to be a period where Dickens was playing with the notion of what it means to be a lead character; whereas in Barnaby Rudge Barnaby was a very peripheral character, Martin junior is actually downright dislikeable for a lot of the early part of the novel. 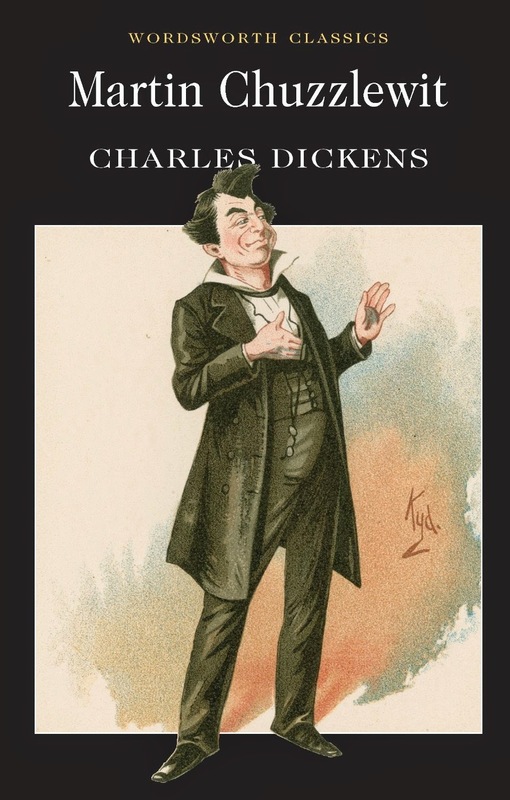 I'm beginning to wonder if Dickens' skill lies not in writing heroes (or at least not in straightforward ones) but in writing villains and peripheral characters, as the only heroes of his that I've genuinely liked from the off are Barnaby Rudge, Samuel Pickwick and his gang, and Nicholas Nickleby. There were also some very odd parallels with Oliver Twist going on, from the relationship between young Martin and his grandfather to the marriage of Jonas Chuzzlewit and Mercy Pecksniff. In a way it almost felt like Dickens was attempting to rework his earlier novel but with a flawed lead character, as opposed to the irritatingly good twist, as the villains of the piece are more than worth rivals to Bill Sykes and Fagin for their cunning and downright nastiness. That said, the characterisation in Martin Chuzzlewit is done wonderfully well. I absolutely love the characters of Tom Pinch, who is so ridiculously good-natured compared to pretty much everybody else that the ending he gets is absolutely heartbreaking (even if you can see it coming a mile off), and Mark Tapley, whose determination to find a situation that enables him to master his cheerfulness and acts almost as a mirror image of The Pickwick Papers' Sam Weller. Finally, whilst I mentioned that young Martin starts off as horribly unlikeable, he's also one of the first of Dickens' heroes who I've actually seen grow over the course of the book, and by the end I was actually really enjoying reading his scenes (even if his personality change did come on a little too suddenly for my taste). And I must add that if you love Dickens' ability to come up with the most utterly brilliant names, Martin Chuzzlewit is an absolute goldmine. Overall, I think Martin Chuzzlewit is possibly the most underrated Dickens novel I've read yet. As well as showing his maturing as a writer in terms of being able to develop characters over the course of the novel and the fantastic names he gives them, it's also interesting to see him once again attempting to rework his characters and plots to breathe new life into them and see them from other angles. Next up for the challenge is Dombey and Son.